I had written about this small applet that shows touchpad status and provides quickly enable and disable touchpad functionality in Ubuntu laptop and netbook. Now,the Touchpad-Indicator has updated with keyboard shortcut and disable touchpad when mouse plugged supported. Touchpad-Indicator can be found under Applications -> Accessories menu. 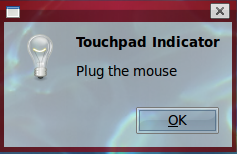 17 users responded in " Touchpad Indicator update with Auto-Disable touchpad when mouse plugged "
I am using a Dell Inspiron, UBUNTU 10.10 and Touchpad-Indicator 0.7.3 is not working. After following the instructions the touchpad is not disabled. Excellent! I came across a bunch of scripts first but this does everything including telling me when it’s disabled and it was only seconds to install. Thanks a bunch! I just updated Touchpad Indicator (0.8.0.9-1ubuntu1 (touchpad-indicator) onto Ubuntu 11.04 and the indicator doesn’t work (just a red circle and slash whether I have the external mouse connected or not) whereas the previous version did (an icon of a mouse with or without a red x on it). You’re better off using the previous version (if you can get it). Wonderful! On Ubuntu 11.04, this works like a charm, including the ‘disable touchpad when mouse connected’. Kudos to the developer!!! Hopefully this will become part of the standard Ubuntu distribution. Touchpads on laptops are mostly nasty little things that get in the way when one types. Not one setting is working. Icon display completely off. Always starts with touchpad disabled even with no mouse connected. Fantastic. It solved me jumping mouse problem when writing 🙂 Thank You. Doesn’t seem to work in Gnome Shell 3.2 and Ubuntu 11.10. Fantastic! Ubuntu 11.10 on HP Pavilion. 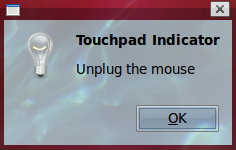 To get it to trigger the 1st time, I had to unplug and re-plug in my wireless USB adapter for my mouse, when I did that I got a popup that the touchpad was disabled. Working great! Thank-you. You have added YEARS to my life! Unfortunately it causes Ubuntu 11.10 to fail to mount any device, connected to USB 3.0. This is buggy in ubuntu 13.04. Crashing when trying to save after checking autostart and disabling tp when mouse is not plugged in.